For some people the idea of going to a party and being surrounded by people they don’t know sends their anxiety meters into the red. We’ve all been there, too: Our social butterfly friend invites us to some social gathering and you know none of the other people that will be there. Bit the truth is, these are the types of experiences in life that make us grow as people. Crawling out of our little shells that we build around ourselves is when we really figure out who we are as people. If the thought of going out to a bar by yourself, or going to a party where you don’t know anyone freaks you out, here are some tips to relive your social anxiety. Who knows, you might actually have some fun. 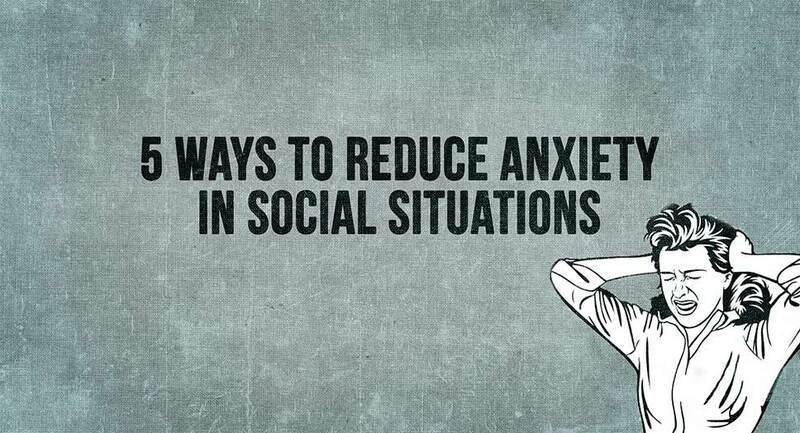 This is the hardest, yet most productive thing you can do in social situations where you are anxious. You feel like everyone in the room is watching you and scrutinizing you, but the truth is – that’s all in your head. Unless you are giving people a reason to focus on you, chances are they are not. Hold your head up, believe in yourself, and remember that you are awesome. Keep in mind that all of the people you assume are judging and scrutinizing you are not perfect either. No on is perfect. If you’re in a crowd of people and you somehow don’t think that you belong, or that you aren’t good enough to be in that crowd – remember that they are just people too. Just a room full of regular, average, normal people who are just as worried about being socially accepted just like you are. Identify with them instead of putting them on a pedestal. When you do actually engage in conversations with people you are just meeting, engage in REAL conversations. What people do for a paycheck is such a small part of who they are, think of a conversation with a new person as an interview, and not just small talk. Invest time in getting to know people, and you’ll find that you not only get to know people better, you connect with them on a level that is deeper than just some random passer-by. Nothing alleviates anxiety like having a partner in crime. The other, bad, side of conversations with new people is when you run into a conversation bully. These people actually tend to increase social anxiety. They can bully you into talking about subjects that you simply don’t care about, or even flat-out don’t want to talk about. If you can shift the conversation in a direction you’re more comfortable with – go for it. If not, find a reason to exit the conversation, and get out of it. Last, but certainly not least, laugh. Smile. Be Approachable. When you are in a crowd of new people, understand that you are exactly as much of an outcast as you want to be. Laughter is something that bonds humans together like nothing else in this world. If you find yourself in a situation where a crowd of people still refuses to accept you into the fold, despite your bubbly, witty, charming nature – chances are you are surrounded by assholes, and need to get out of that situation anyway.